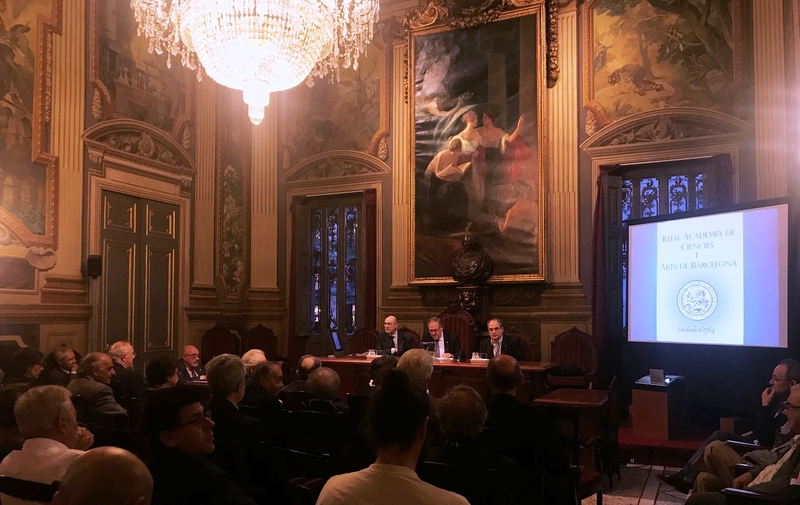 Xavier Obradors inaugurates the academic year of the RACAB with a talk on "Nanomaterials for the energy transition"
Xavier Obradors, ICMAB Director and researcher at the Superconducting Materials and Large Scale Nanostructures (SUMAN) group, inaugurated on Thursday, 18 October 2018, the academic year 2018-2019 of the RACAB, at RACAB building in Les Rambles. Xavier Obradors, member of the RACAB since 2001, presented the report on "Nanomaterials for the energy transition". The session started with a summary of the academic year 2017-2018 of the RACAB, including new members, conferences, meetings, and other activities. 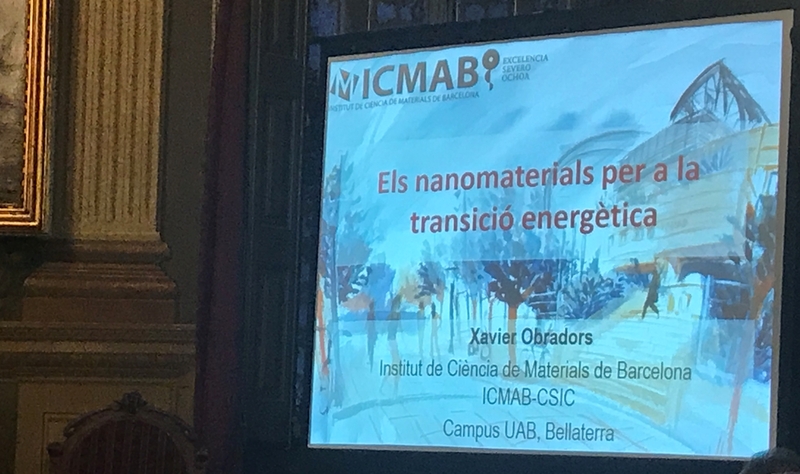 Following this presentation, Xavier Obradors gave his talk on the field of nanomaterials for the energy transition. He started by thanking all the ICMAB researchers for all the contributions they have made to his report, and for all the things he has learnt from them. He then continued his talk, starting by giving a general view of the energy challenges that we are currently facing, including the need to diminish the CO2 concentration of the atmosphere, and the need to go from fossil fuels to renewable energies to achieve it, also including data from the last report from the IPCC. After a brief introduction on nanomaterials, nanoscience and nanotechnology, he focused on three current energy challenges: challenges in the chemical energy or solar fuels (artificial photosynthesis, photoelectrochemical cells...), in the electronic energy (photovoltaics, thermoelectrics), and in electric energy (batteries, supercapacitors, superconductivity). From here we would like to thank the RACAB for inviting Xavier Obradors for giving this conference, and congratulate them for all the activities they are carrying out, including the restauration of the amazing mosaic of the sala d'actes. "The energy transition is a key concept that has already been imposed as one of the most demanding challenges for humanity for the first half of the 21st century. The current energy model, based on the preponderance of the use of fossil fuels, has become unsustainable from the environmental and climate point of view. Additionally, the expected demographic and socio-economic evolution makes it even more urgent to clearly define the goals that must be met in well-defined terms. The technological and resource requirements (~100 % renewable energies in 2050 and an increase in Earth’s temperature below 2 °C) suggest that nanotechnology revolutions are needed in all the areas involved. Nanoscience is a scientific discipline that has evolved extraordinarily in the last two decades and is currently available to facilitate innovations that we could not even imagine. Nanomaterials are the most efficient means of using natural and energy resources to develop all the technologies demanded to comply with the energy transition. In this paper, some key ideas are presented to understand why the nanometric scale is so relevant in order to obtain the maximum performance of the phenomena and the materials that control the processes related to the generation, transport, storage and use of the energy. The challenges to generate renewable energy (solar fuels) are described, to generate or use electronic energy (photovoltaic, thermoelectric, lighting, etc.) and to efficiently use electrical energy (electrochemical accumulators, superconductivity). In all cases, nanomaterials and devices are already described that already show that there is indeed a promising route to base the energy transition in the achievements of advanced nanomaterials manufacturing." Juan Carlos Gonzalez‐Rosillo, Rafael Ortega‐Hernandez, Benedikt Arndt, Mariona Coll, Regina Dittmann, Xavier Obradors, Anna Palau, Jordi Suñe, Teresa Puig. Adv. Electron. Mater. 2019, 1800629. Martínez‐Esaín, J. , Puig, T. , Obradors, X. , Ros, J. , Yáñez, R. , Faraudo, J. and Ricart, S. (2018) Angew. Chem. Int. Ed.. .